Doha, April 1, 2018 – The gap between Qatar’s Energy Industry and Academia to develop a 21st Century research and development (R&D) ecosystem needs to be closed within three years, according to nearly 75% of those polled in an Industry-Academia Survey conducted this week in Doha. Only 3% of the 150 respondents said that progress in closing the gap between industry and academia is not required for at least another five years, while 25% said progress in filling the crevice between the two is required in three to five years’ time. Bridging the gap is a clear challenge for every country but the survey results reflect the positive momentum and urgency that is underway in Qatar to develop a world-class innovation hub. Companies like ORYX GTL are leading the way with initiatives such as the ORYX GTL Student Awards campaign for the Advancement of Post-Graduate Education. ORYX GTL has been sponsoring the ORYX GTL Awards for 5 consecutive years now as part of the company’s CSR program. ORYX GTL has also been partnering with local universities, colleges, and schools in an effort to bridge this gap and hopes to be one of the main industry partners in the academic sector. “Maximizing Qatar’s post-graduate skills is vital to the country’s transformation into a knowledge-based economy as per the National Vision 2030. Therein lies the value of the ORYX GTL Student Awards for the Advancement of Post-Graduate Education in Qatar,” said Mohamed Al Enazi CAO at ORYX GTL. “The Awards are a cornerstone of the country’s effort to enhance the respect and prestige towards research-focused education. 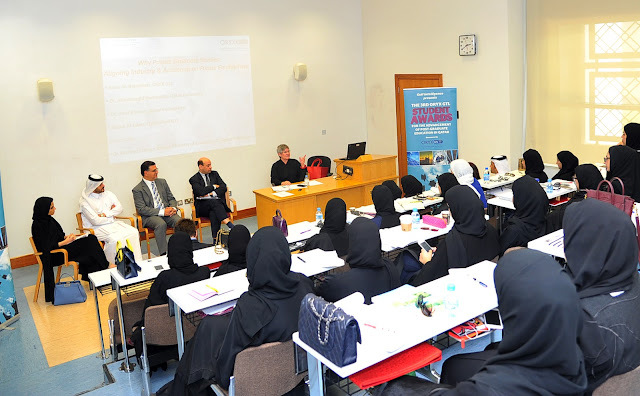 The high-level recognition will bolster the brightest students’ confidence to flex their brainpower in support of local Industry and Academia alignment” Al Enazi continued. Over the last decade, Qatar has demonstrated a brave commitment to innovative research and development, which has successfully addressed the grand challenges of energy security, water security, cybersecurity, and health. More of that pioneering spirit and partnership, combined with new technologies, will be needed going forward as the country prepares to sustain and further advance the production of its resources. Leveraging the considerable opportunity in Qatar is a journey that must be equally shared by industry, academia, and government. 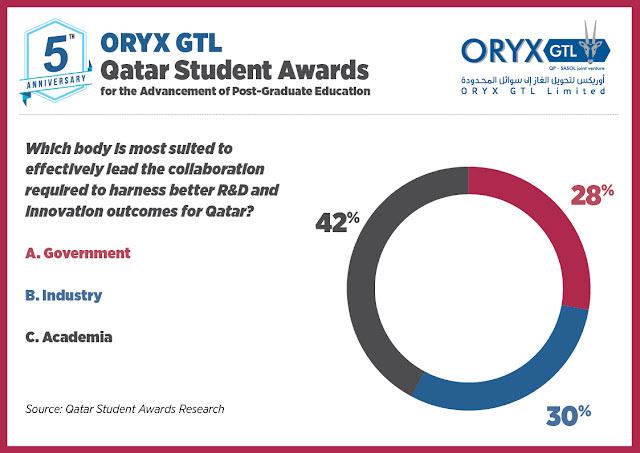 When asked to pinpoint which body is most suited to effectively drive the collaboration required, 42% of survey respondents identified Academia while 30% said that industry should lead to harnessing better R&D and collaboration in Qatar. While Qatar has been improving its R&D infrastructure it must be noted that a large portion of new innovative technologies are still imported through international partnerships. In order for this trend to change, it is necessary to bolster the national capacity for R&D closing the gap between industry and academia. The pioneering student awards each year acknowledge two Masters and two Ph.D students. The annual awards also highlight the importance of building post-graduate education capacity, especially for Qatar’s research and development in energy-related fields. Qatar has focused on becoming an energy R&D hub since 2006 when the government decided to allocate 2.8% of GDP annually to promote technology and innovation via the Qatar National Research Fund.